It seems just yesterday that we were preparing for State Championships, but Regional Championships have quickly crept into the picture. This past weekend I attended the first ever Kansas City Regional Championship, an event that featured 144 players in the Masters division. Headed into the tournament, I wanted to take a different approach with my deck choice from what I did during State Championships. I believe my list for TDK was very good, and nearly unbeatable in match play, but it had the issue that it had to win matches 2-0, otherwise matches would often end in a tie. So for Regional Championships, I decided to go the slow route, that my friend Colin Moll has taken with Hydreigon. That is a deck that plays slower than the rest of the format, and to try to play for one game complete, rather than approaching it as a series. The deck I decided to play was Flygon. It’s a deck that I enjoy playing very much, and I knew ties may be a problem no matter what deck I played, so I wanted to at least play something that I enjoyed to try to get the most fulfilling tournament experience. Now, to elaborate on some of my card choices. 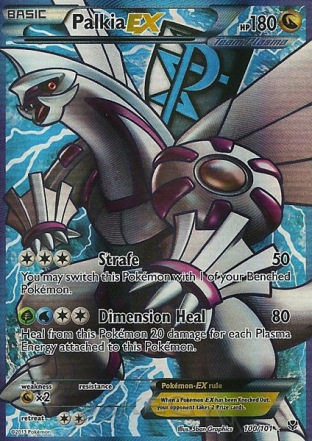 I wanted to make getting my full strategy out as consistent as possible, so I decided to play the Stage 1’s for both the Flygon and Dusknoir lines, cutting some of the tech cards that I loved in the deck. I think this proved to be a wise decision, as I consistently got setup in most of my games. I went with the thicker 3-3 Accelgor line, as Accelgor is better than extra Mew EX against Garbodor decks, and help you stream Deck and Cover against them much better. Additionally, with Virizion/Genesect being a deck on my mind, prizing an Accelgor and losing another to Red Signal would spell game over. I think Jirachi EX is almost needed in any Stage 2 deck. Stage 2 decks are always clunky, and Jirachi EX helps them almost never lose a game to dead draw. I know a lot of people view Jirachi EX as two free prizes, but if they target the Jirachi, then they’re ignoring what’s probably most important to you. Additionally, I would take not losing extra games just from dead drawing, and would take the risk that I won’t lose the game because Jirachi is on my bench. The most interesting twist I took was to include a 1-1 Trevenant line. I’m already playing Accelgor and Dusknoir, so having the ability to switch gears and turn it into a pseudo Trevenant/Accelgor deck on a moment’s notice seemed strong. Additionally, it gave me a Pokemon to Deck and Cover into that could just be setup by evolving, not needing Rare Candy or two evolutions to get setup. Mewtwo EX is in there for X-Ball. Being able to move damage around can allow you to setup KO’s for it, and it’s really good with knocking out something on the bench and then punishing something with a lot of Energy on it. It’s also a good last resort when things aren’t going well. I’ve won games in testing just by N’ing my opponent after they took a bunch of early KO’s and using X-Ball for all my prizes. One thing I really liked to do against Garbodor was to Deck and Cover for the initial damage and poison, and then retreat to Mewtwo EX and use X-Ball to finish it off, then retreat Mewtwo and Deck and Cover again and then repeat. 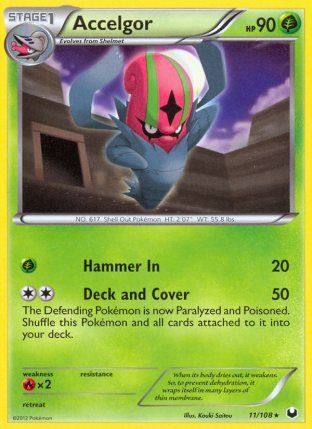 I had a lot of games against Garbodor where I prized my Tool Scrapper or had to discard it early, and this strategy proved effective in dealing with the deck without my Abilities. The strategy of the deck is pretty simple. 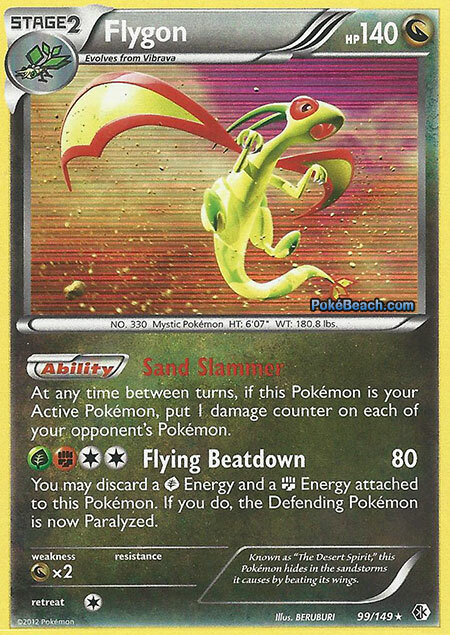 Between Flygon’s Sandslammer Ability, Accelgor’s Deck and Cover, and poison damage, you are able to get a lot of damage onto the field very fast. 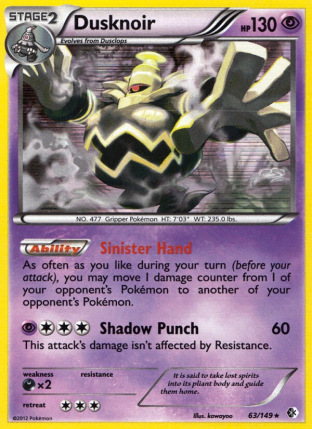 From there, you use Dusknoir’s Sinister Hand Ability to move damage around. 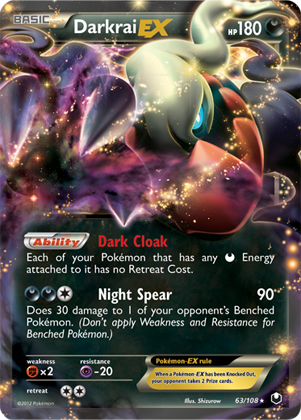 I generally would try to spread the damage out to all of their Pokemon, while maintaining Deck and Cover loops. And then when I had enough damage on the field, I would try to take all six prizes in one turn. The importance to approaching the game in this manner, is that it can really stretch games out, which is important when you’re just trying to make the series into one game. Additionally, it makes you invulnerable to N’s, while being to punish opponent’s with your N. The longer you can go with maximum draw power, the better. Against some decks this doesn’t work. 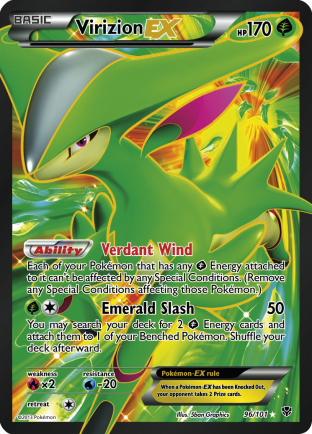 For example, knocking out a tech Keldeo EX, Virizion EX, or something that moves Energy around like Aromatisse will take priority against such decks. One of the nice things about Sandslammer, is that you can maximize your damage by placing Pokemon on your opponent’s bench to 10 HP left, and then Deck and Cover and let the Sandslammer damage knockout multiple Pokemon all at once. My round one opponent was a local player, who actually ended up getting 2nd at the tournament. In the first game, I got a solid setup, and got some Sandslammer damage off before he could get Garbodor out. I had to chuck Tool Scrapper early, as well as my Dowsing Machine to get setup, so I had to live with Garbodor on the field once it got there. I was able to just maintain enough Deck and Covers until I got the win. In the second game, I prized 2 Tropical Beach, and got kind of screwed by that after it was bounced by Virbank City Gym. I never really drew much of anything else, never seeing a draw supporter or a ball to search out Jirachi EX, so I ended up losing this game fairly fast. From there, time was called on the first few turns of game 3. In my second round, I played against a Hydreigon deck. The biggest challenge in this matchup was his Virizion EX, but the thing I had going in my favor, is that his deck didn’t have many options to OHKO a Flygon, so I was able to tank those with Max Potion, giving me a long lasting loop of Deck and Covers until I had enough damage to knockout his Virizion EX. From there, I just used Deck and Cover when I could letting the damage build up. After the Virizion EX was knocked out, I think it was pretty clear that I was going to win, but my opponent never scooped, so by the time I won game 1, time was called at the very beginning of game 3. 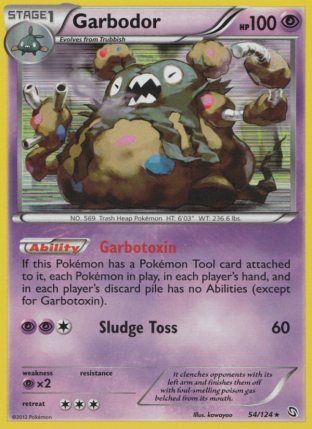 In my third round game, I was playing against another Garbodor deck, and prized my Tool Scrapper. I don’t think he played any Switch or Escape Rope, so when I used Deck and Cover, his Pokemon were going to get stuck Active. I used X-Ball when needed for KO’s, and I believe I was able to take advantage of Virbank City Gym at some points to maintain the perfect lock. Game 1 took a long time, so Game 2 didn’t get many turns in before time was called. In this game, I was playing against a Yveltal EX/Darkrai EX deck without Garbodor, but it posed a new threat in Keldeo EX. In the first game, I get a very good setup, and was able to move damage to knockout the Keldeo EX fairly early on. Once Keldeo EX was down, I was in full control of the game. In the second game, I got a less than stellar setup, and his Keldeo EX got a much longer life in this game, letting him get more attacks in. The bigger problem was that I kept whiffing Energy, so I went turns without Deck and Covers, limiting my damage output. On the penultimate turn of the game, I whiffed the Deck and Cover. If I could have hit it that turn, I could have knocked out his Keldeo EX, and then had a chance at making a game of it. As both games were fairly long, there wasn’t time to finish game 3. In my fifth round game, I played against an Aromatisse deck. These weren’t very good games, I drew poorly both games, never being able to get really setup. This was a big issue as he had both Palkia EX and Virizion EX in his deck, giving him two counters to my deck, as well as Max Potion for a third counter. I’m not sure I had a very good chance at winning, even with a good setup, but getting setup poorly made it impossible to win with all of his counters to my deck. And with that, my first and only loss of the game, I was eliminated from top cut. In round 6, I played against another Yveltal EX/Darkrai EX deck, this time without Keldeo EX which makes it a fairly good matchup. In the first game, I get a normal setup, and am just able to win the game easily, putting a lot of damage onto the field with Sandslammer, while maintaining the lock with Accelgor. In the second game, I setup poorly, and scooped fairly early to try to leave time for a game 3. Time was called fairly early in game 3, but I got a fast enough setup that I felt I might have a chance to win. What this game came down to, was I took 4 prizes to 0 I believe, had Deck and Cover on his Darkrai EX to put it to 150 with Virbank City Gym in play, so it would get knocked out going back into my turn. There is no way that I would have lost this game, but because we are given the insufficient time limit of 50 minutes, it goes down as another tie. In the seventh round, I finally have to play against the dreaded Virizion EX/Genesect EX matchup. Now this isn’t fun to play against because you don’t Paralyze them, but that doesn’t mean you can’t beat them. I beat a Virizion EX/Genesect EX deck at the league challenge I played Flygon at the previous weekend, so I was confident I could win this matchup. I go first, and just get as good of a turn one as you can ask for. I finish the turn with a full bench, with multiple Trapinch, multiple Shelmet, a Mew EX, and Duskull on the field, and am able to Tropical Beach for 7. On the next turn, I get multiple Accelgor, Vibrava, a Flygon, Dusclops, and a Deck and Cover. For a difficult matchup, these are the type of setups you dream of. Now this game ended up finishing crazy, as my opponent was able to Red Signal and KO my Dusknoir, and I had no way of getting another out this game. However, I was able to take key KO’s on his Genesect EX’s that he was attacking with, and he was left with little Energy left in his deck and on the field. So how this game ended up finishing by Flygon hitting a Virizion EX with Sandslammer 17 times for my final knockout of the game. After that, my opponent decided it wasn’t worth playing game 2 as there probably wasn’t enough time to finish it. This round, I play against another St. Louis player, playing Aromatisse, this time without Palkia EX, which makes me happy. In the first game, I get a poor setup, and can’t do much against the deck as he has Virizion EX and Max Potion still, and I need a relatively fast setup to deal with the deck. In the second game, I get the fast setup I want, and am able to knockout both of his Aromatisse, which is important, as it locks Energy on specific Pokemon, preventing them from using Max Potion without discarding all the Energy attached to them, which is a fine enough outcome. 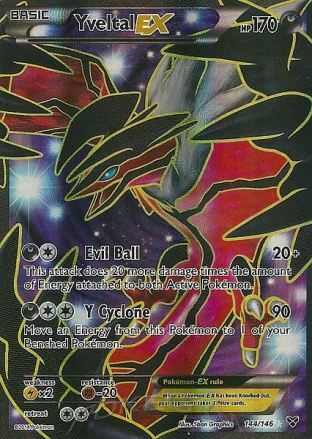 He also had difficulty getting Virizion EX out, so I got some free turns of no damage going onto my field with Deck and Cover locks. Time is called as were setting up for time 3. My opponent was gracious enough to mark a win on the match slip for me so I would have a chance at Top 32 points, which I’m very grateful for, especially after losing another match that I would have won earlier to a tie. So in the end, my final record was 4-1-3, for 26th place. 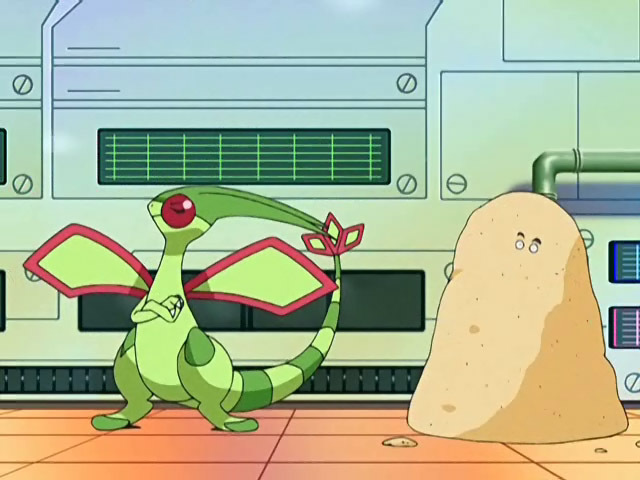 I think Flygon could have worked for me in this tournament if I adjusted the way that I played the game. There is no doubt in my mind that my ties in rounds 1 and 4 could have been wins if I had just slow played my opponents. If I just slowed my play down in the first games, then there would not have been time for game 2 to finish, which would have given me the wins. However, I don’t feel it’s right to stoop to such low levels, and I think you should work on the slowness of the deck, and not the slowness of your pace of play to try to execute this strategy. Yeah, you can slow your play for optimal results, but it just doesn’t feel right to do that. I was a bit disappointed not to play any Emboar or Blastoise decks, as they are very good matchups, and quite a few did well at this tournament, but the early ties knocked me out of the bracket of points with those players. The one change I would make was to cut the 1-1 Trevenant line for a Silver Bangle and then probably a Colress or a second Mew EX. 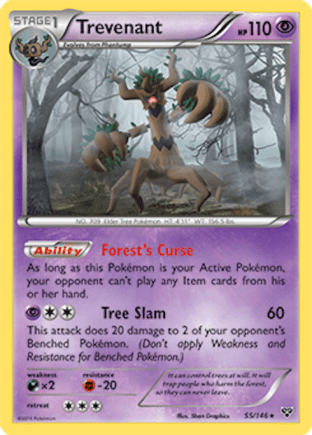 The Trevenant line wasn’t very useful in this tournament, even though I used it a lot in testing, and used it to great effect in almost all of my games at the League Challenge I played Flygon for the past weekend. So that’s probably it for my adventure with Flygon. Between this tournament and the League Challenge, Flygon was able to get me 45 more championship points to put me up to 307 on the year. Worlds doesn’t seem too likely, but if I can have a good finish at Regional Championships next weekend, there is the possibility that I could clinch a Worlds invite with a Top 32 finish at Nationals, and there’s always the possiblity of another Last Chance for Championship Points tournament that I could play well in to seal the invite. I think I made the right choice in playing Flygon. Ties were an unavoidable burden as I had predicted, so I was at least happy that I was playing a deck that I enjoyed in this tournament. I really hope they get rid of best of 3, 50 minutes for next season. I don’t think it’s a very fun format, and I think it really limits the type of decks that players are able to play and do well with. I know I probably won’t be playing in higher tier events much next season if they keep the system, it’s just not very fun, but I’m too invested in this season to just abandon it at this point.